Experience the R/Evolution – an entirely new class of yacht. 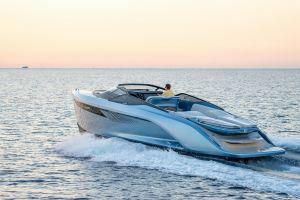 Designed in partnership with the world-famous BAR Technologies and Pininfarina, the all-new R35 brings a craft unique to Princess and to the current yachting market. 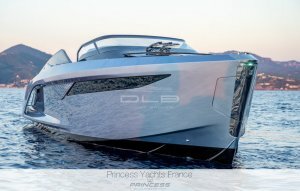 Combining the very latest in advanced technology and naval architecture, this game-changing yacht with its unique Princess Active Foil System (AFS) delivers the fastest and most efficient Princess boating experience to date. Not normally associated with sport yachts, the R35 has a wraparound walkway providing easy and safe access between the spacious cockpit and the bow. 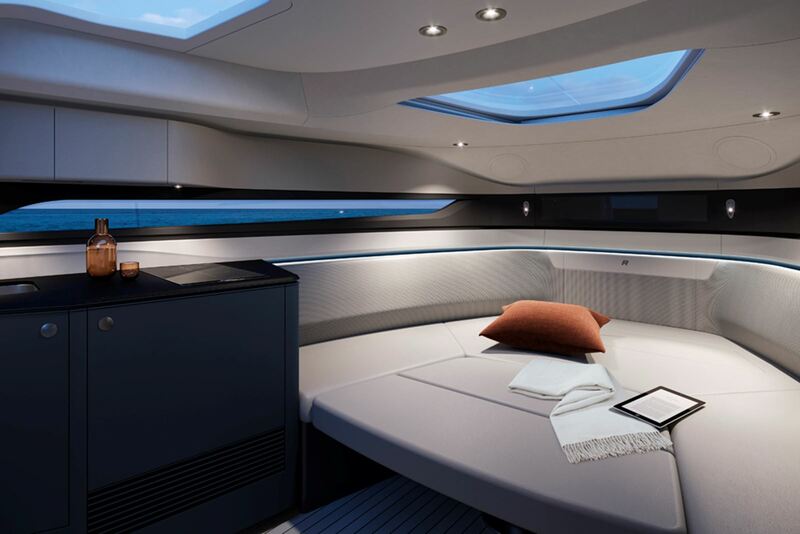 In the cockpit, a large U-shaped sofa provides ample entertaining space to relax, unwind and socialise with a smart removable table for dining. 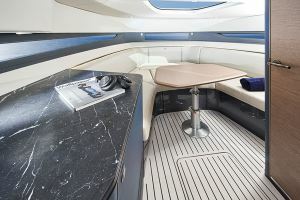 A large sunpad aft of the cockpit allows guests to soak up the rays whilst being able to socialise with the group on board. As for technology, you won’t find yourself short on board. 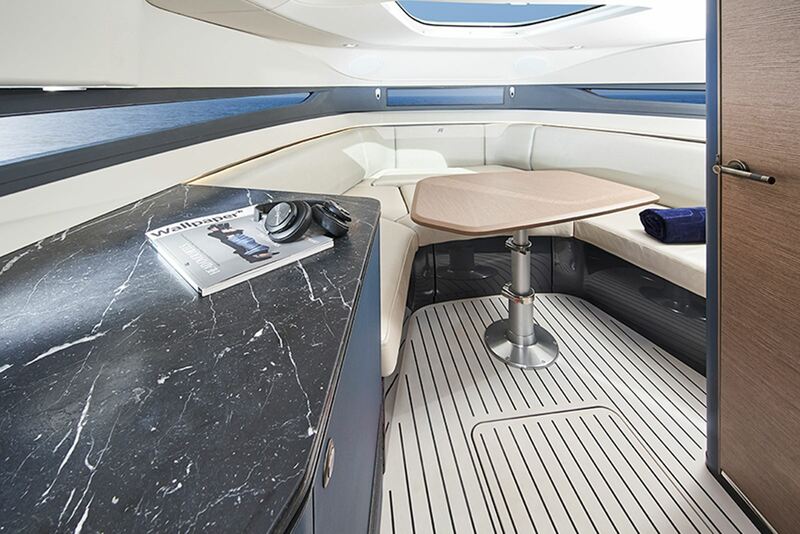 Three beautifully upholstered sliding helm seats allow you and your guests to be up close to the action. 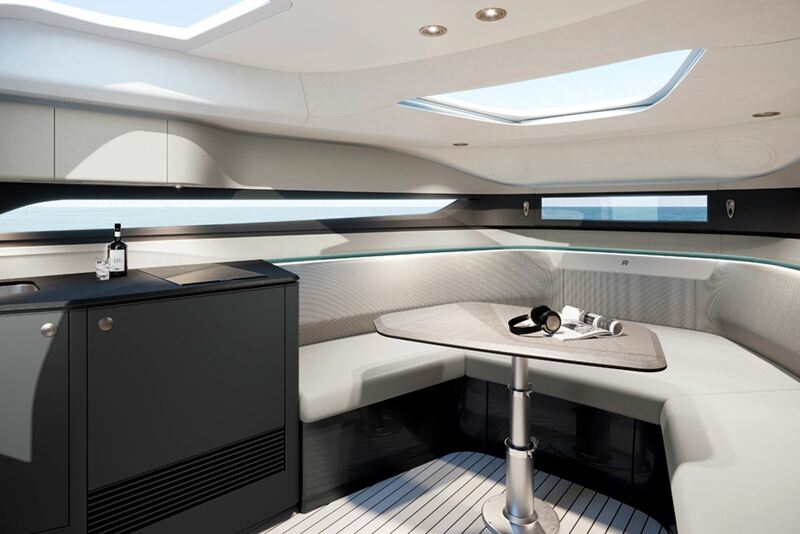 Twin 17″ Volvo Garmin touchscreens display all engine and onboard data through a bespoke suite of interface pages, designed exclusively for Princess. The user-friendly system allows you to connect with the vessel, monitoring engine data, managine onboard environments and giving control and visual feedback of the AFS with electric switching. 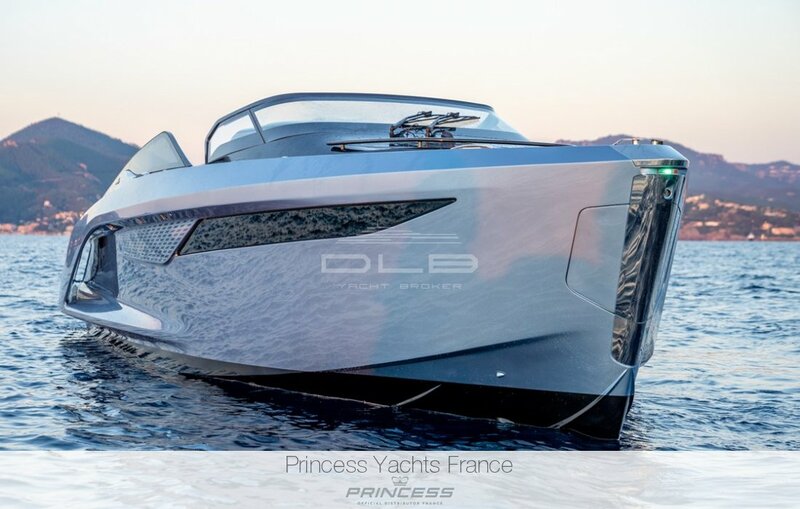 “This was a very exciting project for the Princess Design Studio where our aim was to create a boat that is innovative, exciting and forward thinking in terms of finishes and styling, whilst retaining the integrity of a Princess in terms of practical use, well-considered execution and absolute attention to detail” – Sarah Verey, Director of Creative Design. 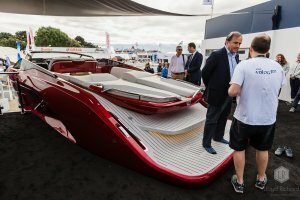 Hydrodynamics are the new fast forward in yachting. 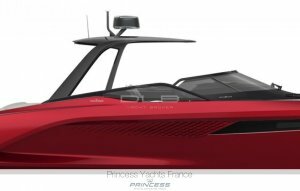 The Princess Active Foil System (AFS) developed in partnership with BAR Technologies – the British company behind Britain’s attempt to win back the America’s Cup, works in conjunction with the hull to dramatically improve stability, comfort and seakeeping whilst reducing drag by up to 30%. 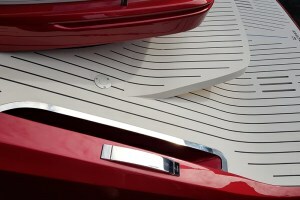 Port and starboard foils adjust independently of each other, their positions calculated 100 times per second by an onboard computer to re-define ride comfort and high-speed cornering ability. 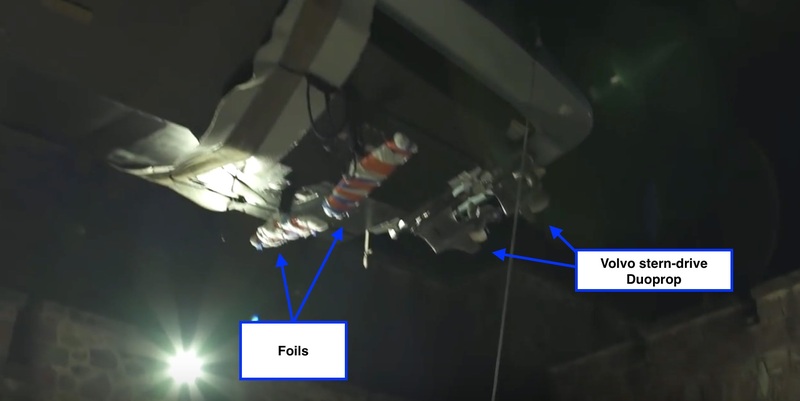 Unlike other foil technologies, AFS does not lift the hull out of the water. 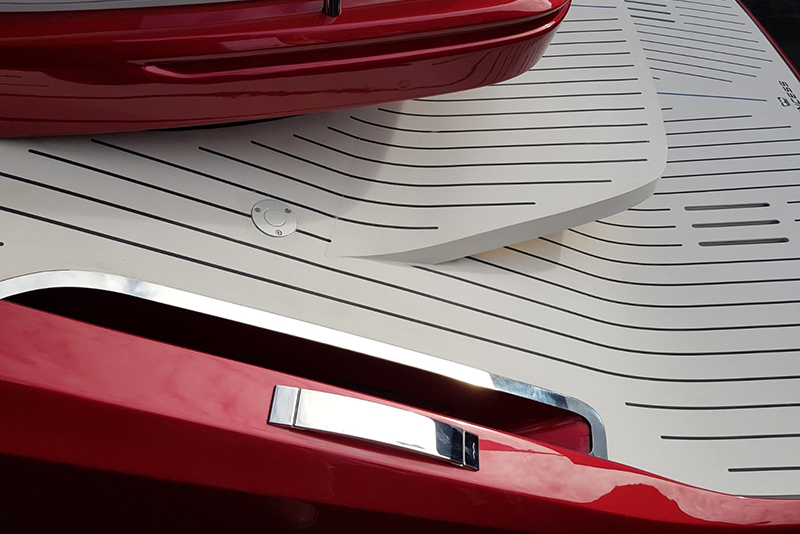 Instead, it adjusts the heel angle and attitude of the boat ensuring the most effective contact area at the bow at any speed for stable travel and extreme levels of grip. 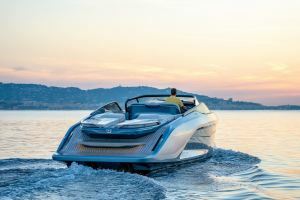 A mode selector at the helm allows you to choose between Sport and Comfort control algorithms which adjust the attitude and responsiveness of the foils to suit your wishes. 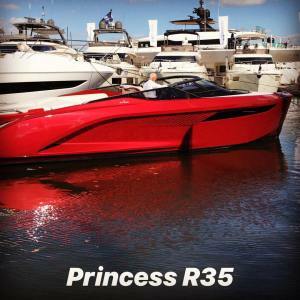 AFS works with the sea rather than battling against it, providing a completely new, on the water experience. 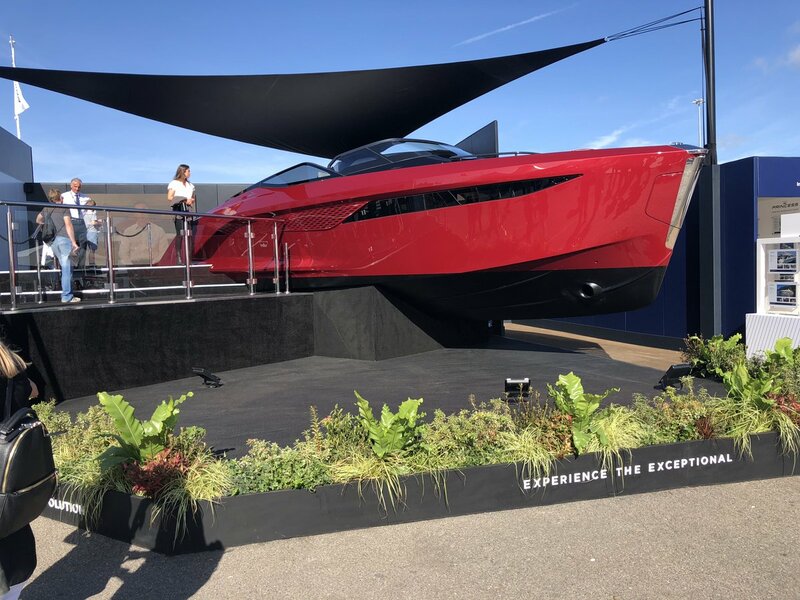 In the following photos, it is possible to see the two famous FOILS that will unfold under the boat to create an effect that will reduce the drag of the R35 by about 30%. It is in itself a revolution. 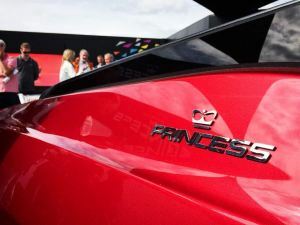 The R35 is almost totally carbon fiber. With 430 hp Volvo V8 engines, get ready to reach 50 kn. She was on show at the last Fort Lauderdale Boat Show (Nov 2018) at the Princess Yachts booth. 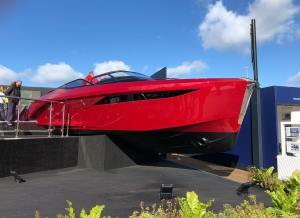 Its red color gave it an exceptional look. Hard to resist at a glance. 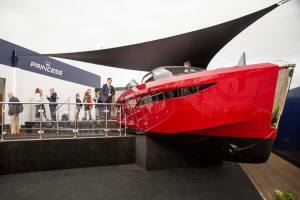 It is ashame that people did not suspect the technological development that was necessary to make this beautiful yacht. It is our pleasure to describe it in this article. Here is a link with a presentation of the manufacturer Princess.